Stuart & Stuart are proud to present this impressive detached family home which enjoys five bedrooms, two bathrooms, multiple living areas, a charming south-facing garden and excellent private parking. Promising a quiet semi-rural setting with spectacular open views, within easy commuting distance of the capital. Welcoming you into the home is a hall housing cupboard storage and a WC cloakroom. Positioned to the left of the hall andoccupying an exceptionally generous footprint is a dual-aspectliving room flooded in sunny natural light and elegantly enhanced bydecorative coving and a timber and marble fireplace, inset with a coal effectfire. Further notable features include a captivating rural outlook and direct garden access - benefits also featured in the adjoining formal dining room which allows space for a six-seater dining table and chairs. Incorporating a further seated dining area, ideal for casual family meals, is a well-appointed kitchen fitted in a modern country-kitchen style. Here, a wide selection of timber cabinets is accompanied by lightly-toned worktops, integrated downlighting and goods comprising a double oven, a microwave and a dishwasher, and an integrated fridge. South-facing with a dual-aspect outlook, this sunny and spacious kitchen is further heightened by the home’s magnificent open views. A neighbouring utility room provides plumbing for laundry appliances, as well as garden access – handy for muddy boots! 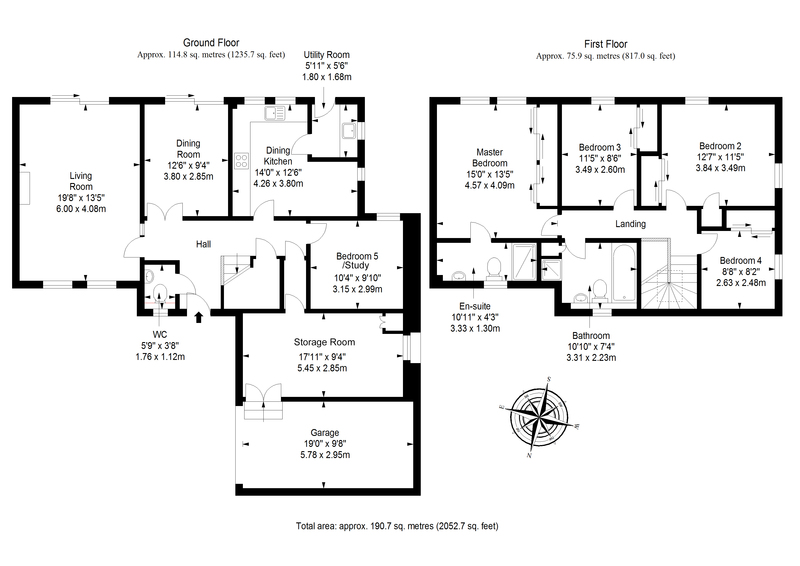 Also located on the ground floor is the fifth bedroom/Study on offer (benefiting from the property’s south-facing position), and a storage room with built-in storage and garage access. From the hall, a handsome open staircase leads up to an airy landing accommodating four double bedrooms, all supplemented by fitted wardrobes. Three of the bedrooms, including the master, are set to the rear of the property thereby enjoying a south-facing aspect and far-reaching country views, with one room also benefiting from windows to two sides. The remarkably spacious master bedroom is complemented by an en-suite shower room featuring a WC-suite and a large shower enclosure, whilst, finally, a family bathroom comes replete with a WC-suite, a bathtub, a separate shower enclosure and cupboard storage. The property benefits from gas central heating and double glazing throughout. Outside, this remarkable family home’s immaculately-kept rear garden gives way to rolling fields and enjoys sun throughout the day. This picturesque outdoor space includes a secluded patio terrace and a neatly-tended bordered lawn. To the front of the house, a large tarmacked driveway and an integral garage provide private parking for several vehicles. To arrange a viewing, Sun 2-4pm or call S&S 0131 202 1888.